Introducing the Digital Juice Spyder Pod - see it in action! 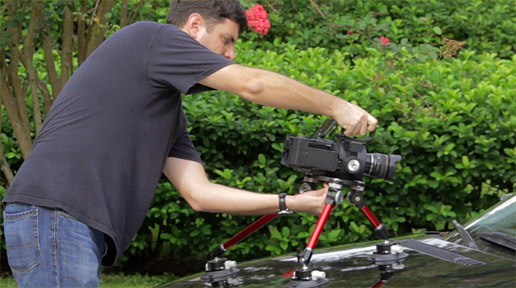 Shooting video from a moving vehicle for photographers, videographers and filmmakers can be a challenge, but a reliable vehicle camera mount can add tremendous impact to your shots and increased value to your production. Until now, vehicle camera mounting systems have been expensive, ungainly, complicated, risky to use, unattractive to look at -- or all of the above. 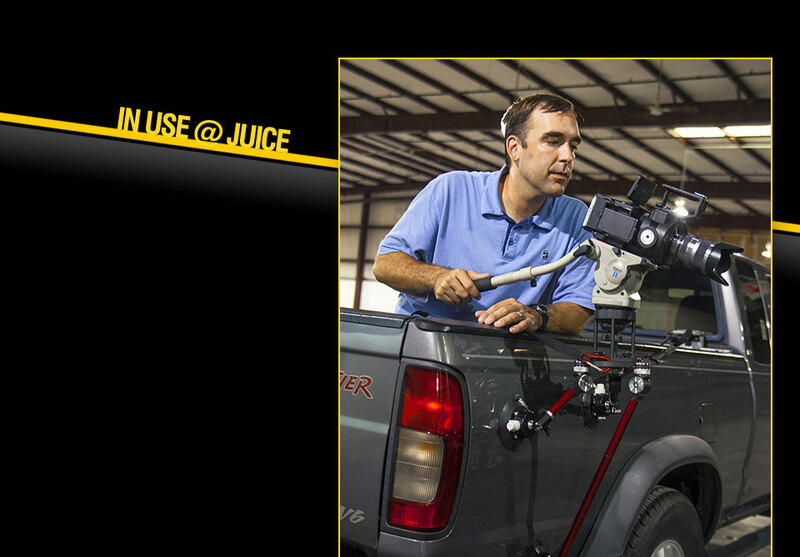 Once again, Digital Juice comes to the rescue with the development of an affordable, compact, vehicle camera mount solution which is innovative, attractive, easy-to-use, reliable and a tremendous value for the money. The Digital Juice Spyder Pod Vehicle Camera Mounting System is a complete solution for photographers and filmmakers contained in a lightweight attractive carry bag. Using three professional-grade suction mounts and built with precision-machined high-grade aluminum and stainless steel components, this high quality vehicle camera mount system is strong and secure - giving you the confidence you need to safely achieve your desired moving vehicle shots. 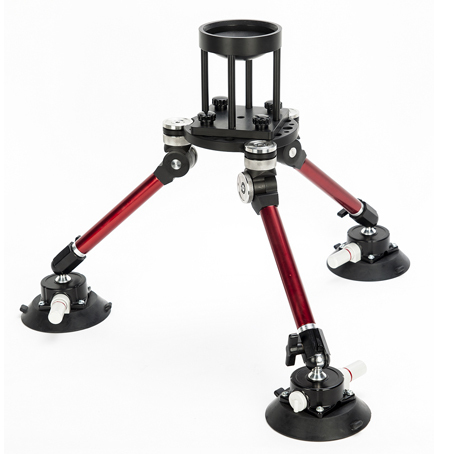 Each suction mount is fitted with an adjustable ball joint, allowing for an extensive range of lockable positions for the attached interchangeable multi-length legs. 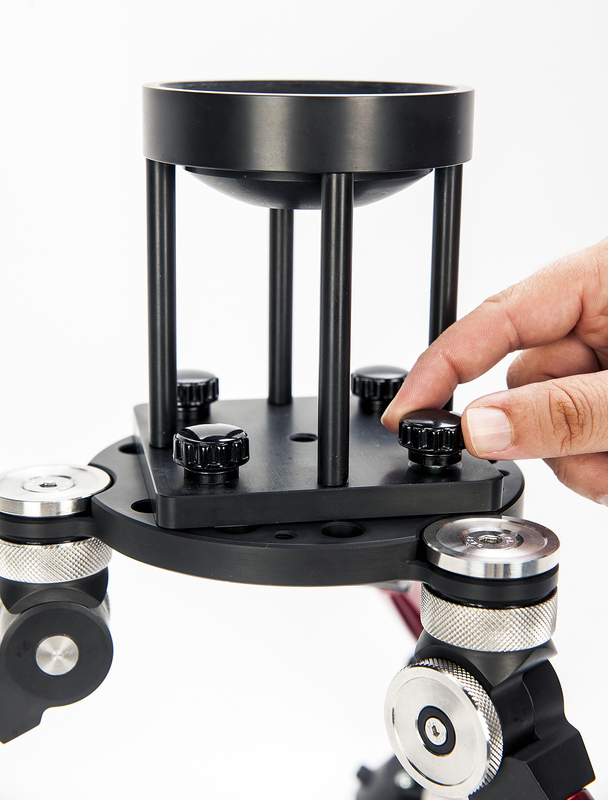 The camera mounting stage of the Spyder Pod has three attachment points for the suction mounted legs, each fitted with two positive locking ratchet joints, one for tilt and one for swivel. 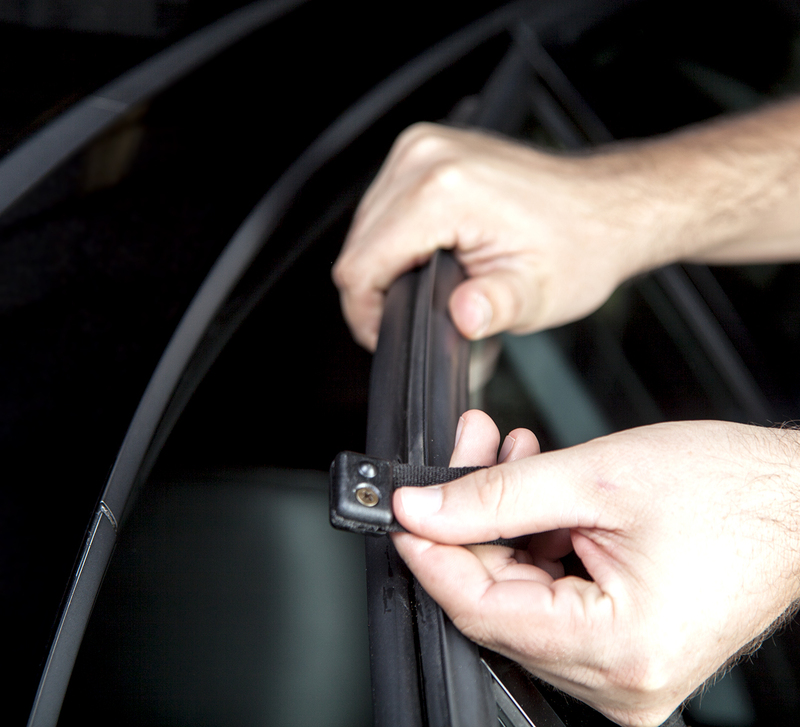 Each joint has a quick-turn lock ring that makes adjusting and locking supremely easy. This innovative ratchet lock system improves on the usual friction lock method through the use of a spring-loaded ball bearing mechanism which ensures that there will be no camera-jarring slippage during use. 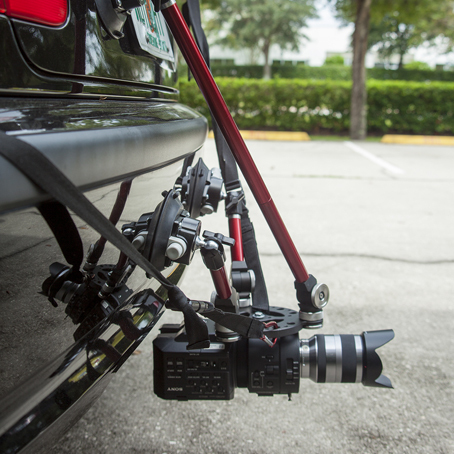 As a final bonus, the Spyder Pod mounting system also includes a comprehensive safety kit that allows you to safely secure your camera to three additional anchors on your vehicle, a safe, secure vehicle camera mount perfect for beginners and professional photographers and filmmakers. 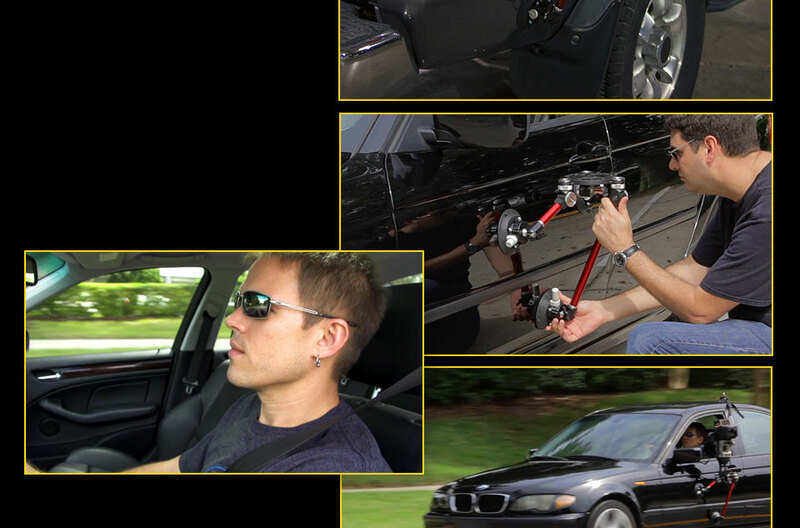 A reliable vehicle camera mount with variable length legs, adjustable locking joints, suction mounts & more! 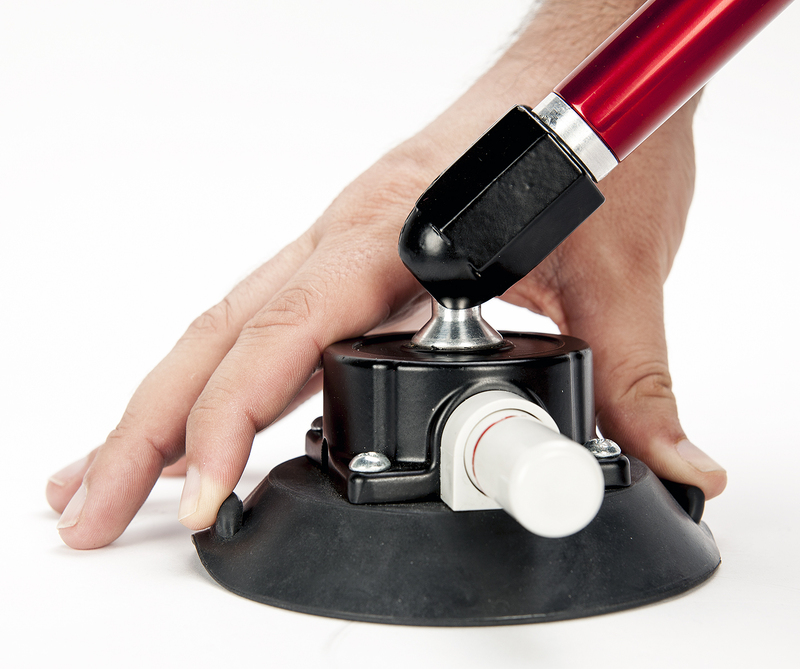 Vacuum-actuated industrial grade 4.75" suction cup mounts can be affixed to just about any smooth surface on any vehicle. 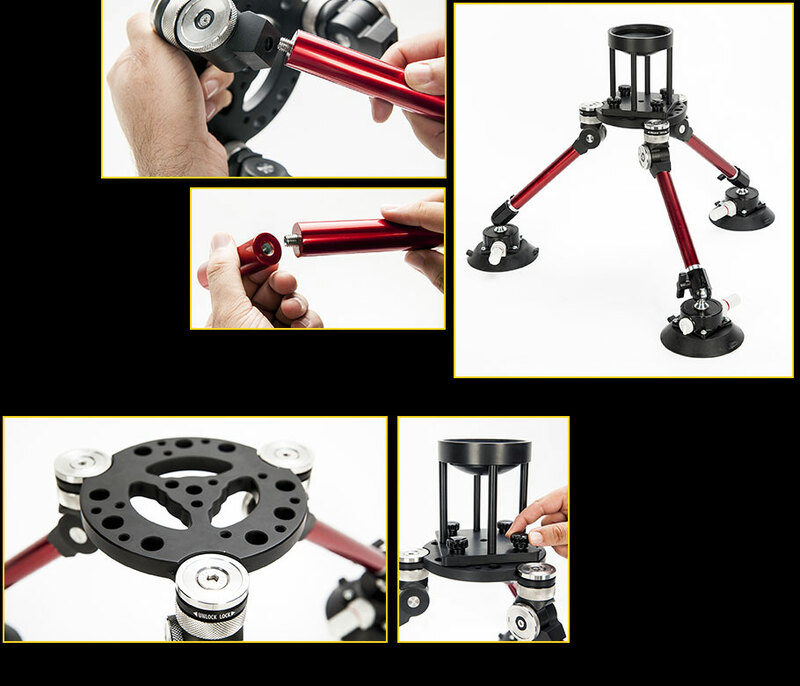 You get a solid, stable, adjustable base for the Spyder Pod's 3 variable length legs. A few pumps of the large pin on the side of each unit and you are in business. The built-in low suction indicator helps to insure that Spyder Pod, and its valuable cargo, remain securely attached to your vehicle. 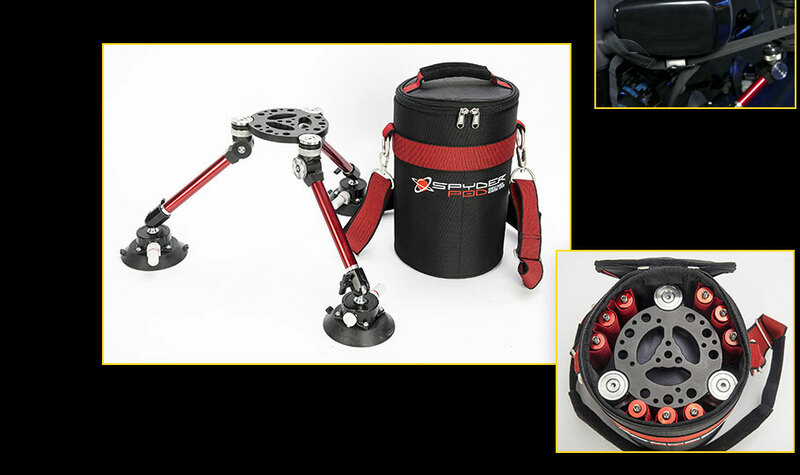 Variable length legs, adjustable ball joints on top of each suction cup, ratcheting attachment joints and a variety of accessory mount and safety tether options mean you can adapt the Spyder Pod to any shooting situation quickly and easily. 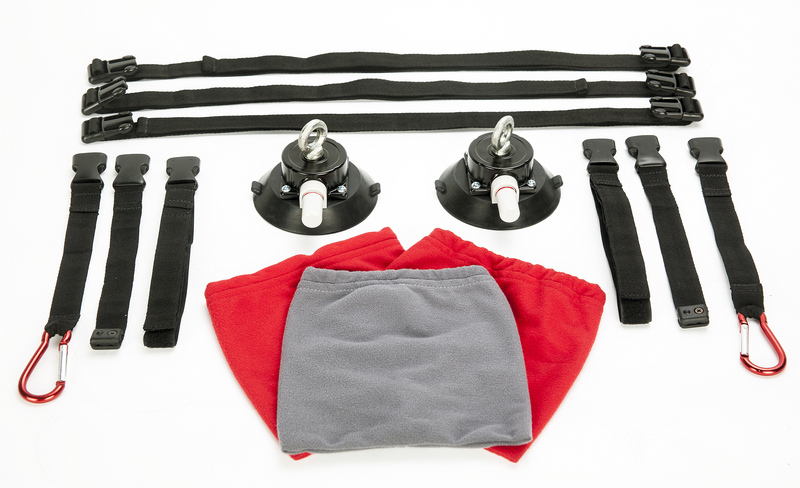 Spyder Pod components are made with a high attention to quality, durability and usability. They also combine to form an attractive, professional-looking piece of gear that you will be proud to display on any production set. You get everything you need in a lightweight, compact package so that you can safely and easily mount just about any camera to any vehicle in a wide variety of configurations and positions. You don't have to worry about damaging or dropping your gear when getting that all-important moving vehicle shot. Plus, you can rely on the shake-free footage you can capture with your camera attached safely where you need it. 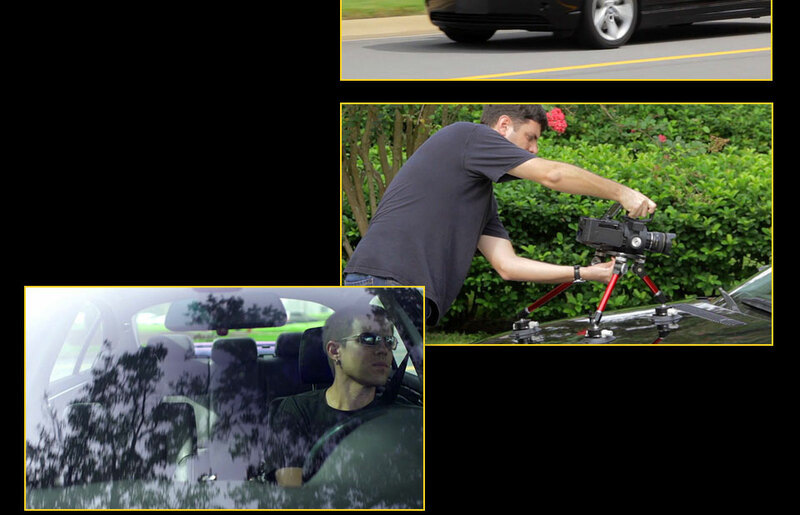 Just about any camera rig or setup can be safely accomodated by the Spyder Pod on your next vehicle shoot. 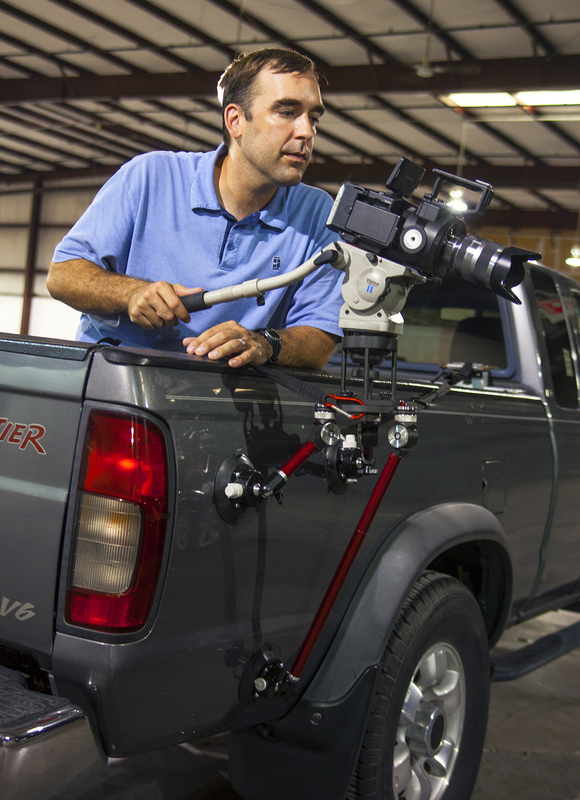 How does Spyder Pod differ from other vehicle camera mounting systems on the market? 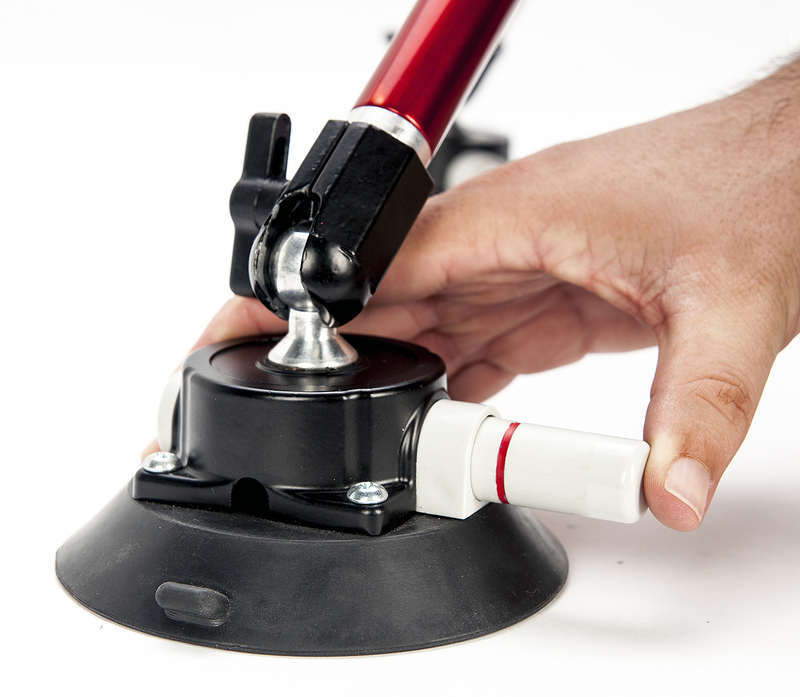 The Spyder Pod system is more intuitive and easier to use than its competitors because of its compact size, its stable three-legged quick-attaching suction mounts and toolless assembly. Its sleek attractive looks are the best in the industry, meaning you will look and feel more professional when you take it on the road. 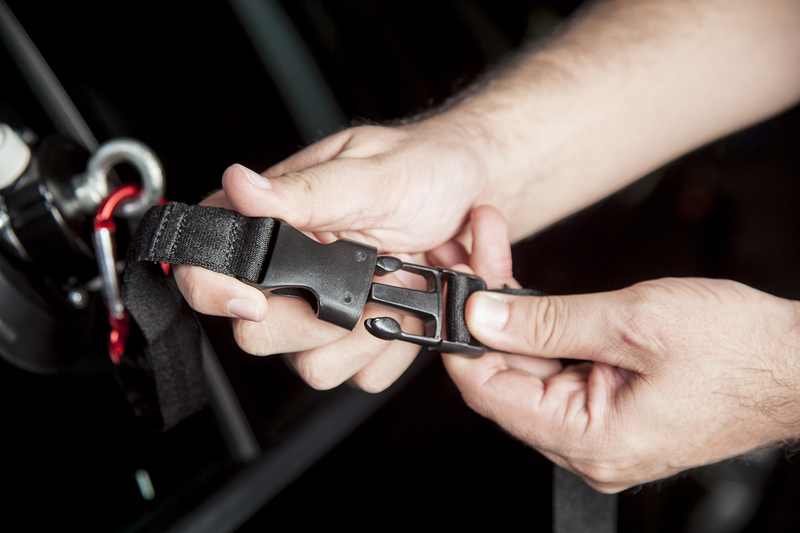 And, unlike other manufacturers, we include a versatile, easy to use safety kit to give you peace of mind when getting those crucial moving vehicle shots with your best camera equipment. 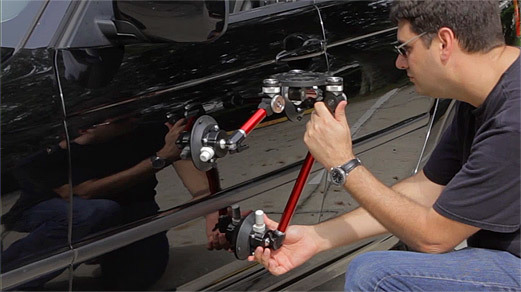 But most importantly, its innovative positive-locking ratchet joints were specifically designed so that they won't slip and cause camera shake when you hit the normal bumps of the road with the camera rolling. What kind of camera setup is supported on the Spyder Pod? Just about any camera and gear configuration is possible. 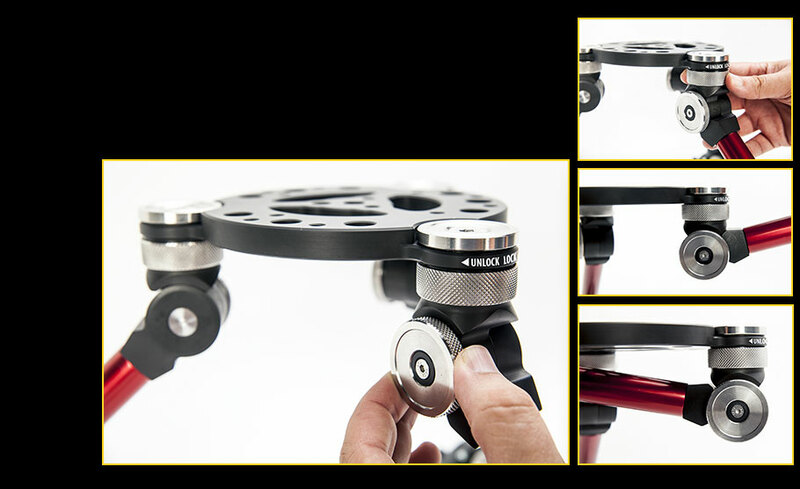 The versatile camera plate of the Spyder Pod allows for an infinite combination of accessory and camera mount combinations from high hat/fluid head support to direct camera attachment with additional articulating arms, portable lights and monitors. 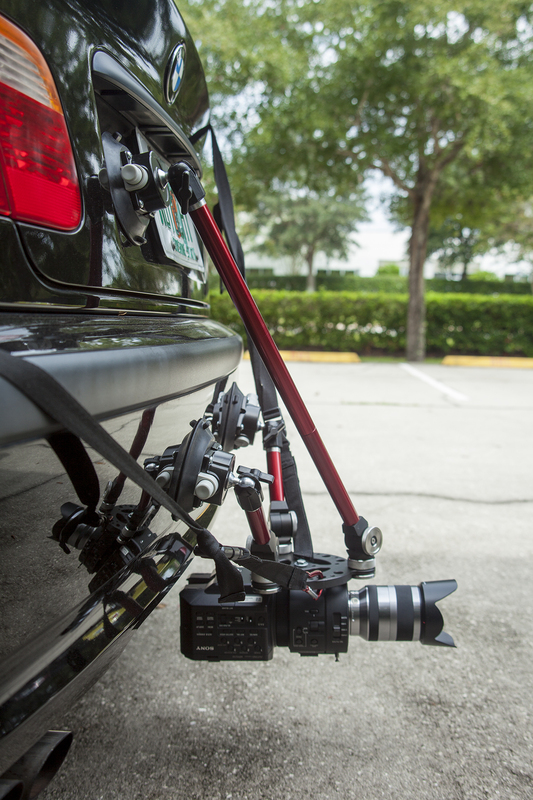 The unit as a whole can support a recommended weight of up to 50 pounds when attached to a vehicle via the three suction mount legs, which allows for just about any camera/gear combo you will need to use. 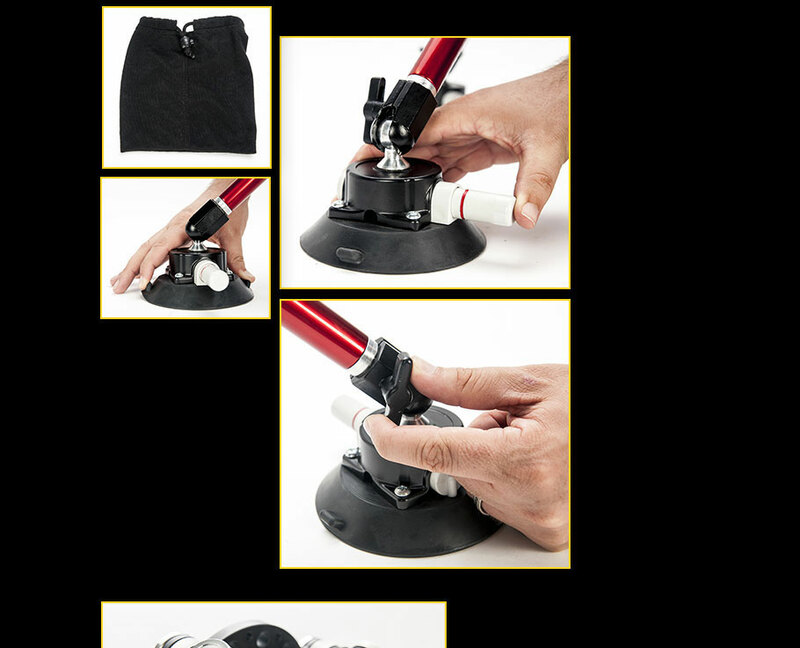 Vacuum-actuated industrial grade 4.75" suction cup mounts are each contained in their own black soft cloth bag to keep them clean and undamaged so that adhesion will be optimized every time they are used. A few pumps of the large pin on the side of each unit and you are in business. A red line on the side of the pin will disappear once adhesion is achieved. 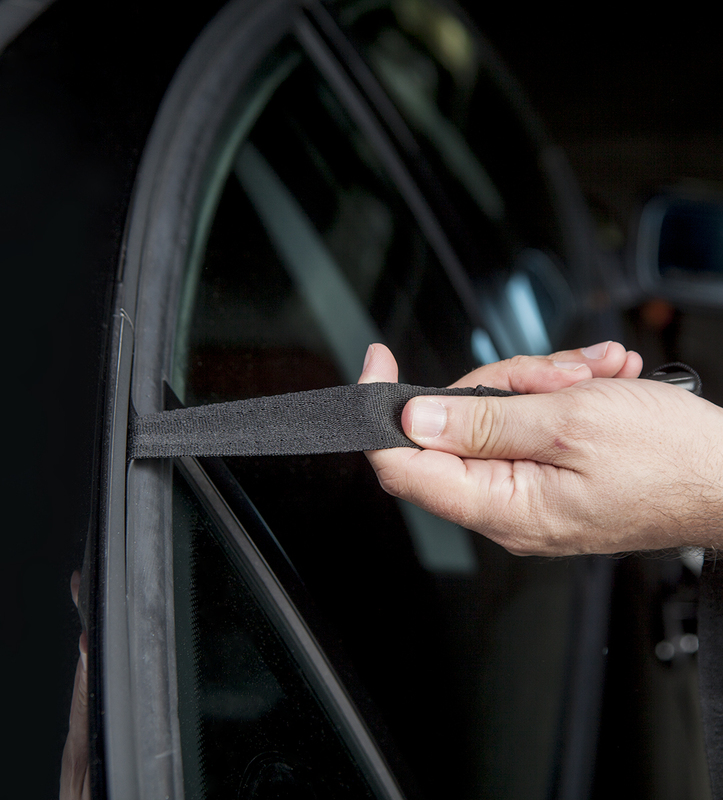 Releasing the suction when you are done is as simple as lifting one or both of the tabs on the sides of the suction cups. 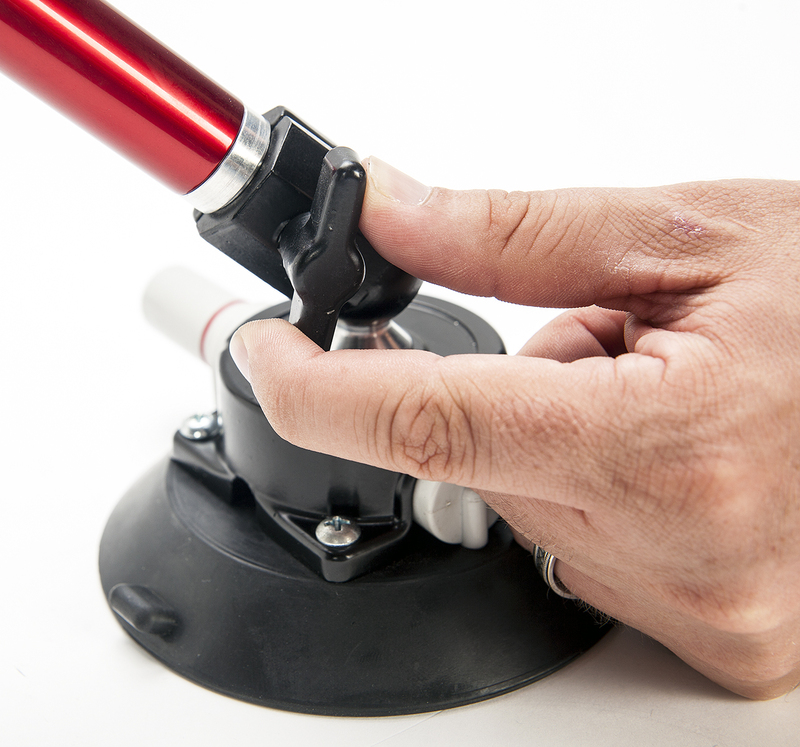 Each suction mount is fitted with an adjustable ball joint allowing for an extensive range of lockable positions for the attached legs. 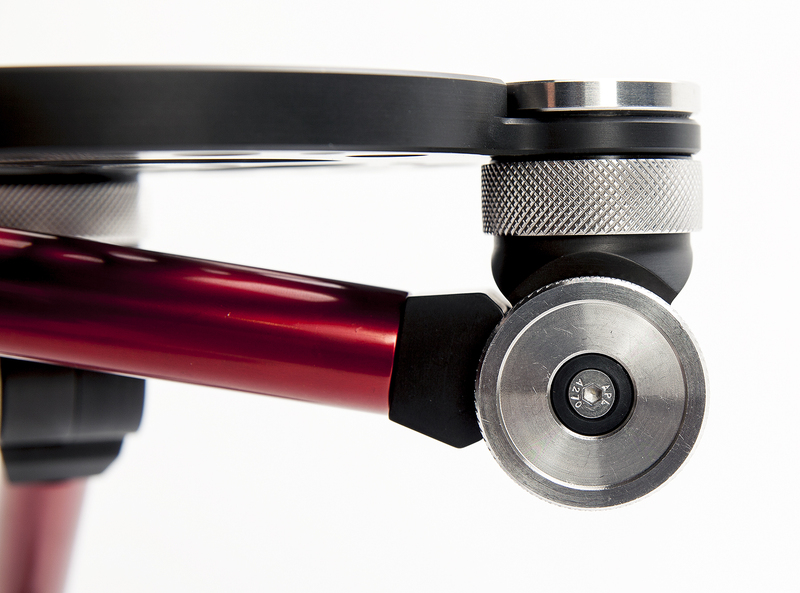 Three adjustable length legs attach to the camera base plate joints. The nine leg extension rods are all 7/8" in diameter. Three rods are provided for each length - 3", 6" & 12". These rods can be linked together in any combination you need to create the perfect length Spyder Pod legs to fit your shooting situation, positioning the Spyder Pod unit at a variety of distances and angles from the vehicle. 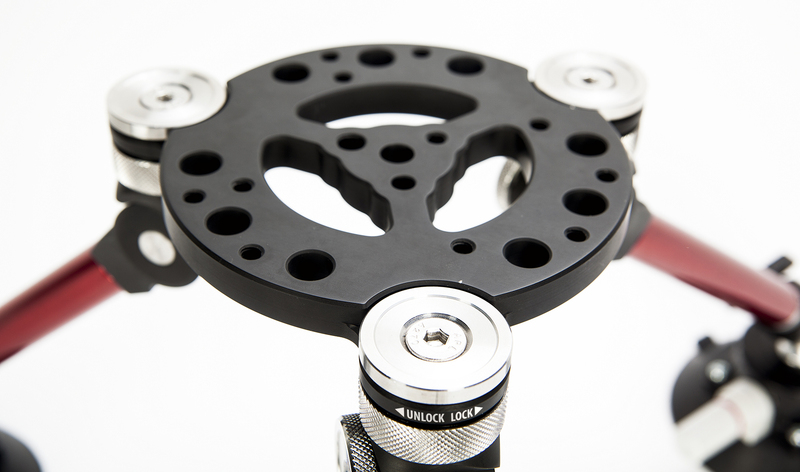 The versatile camera mounting plate has one 3/8"-16 threaded and eleven 1/4"-20 threaded mounting holes, in addition to a thru-hole for each thread pitch, allowing you to attach accessories such as articulating arms, lights, monitors and more. It can also accommodate just about any camera configuration. 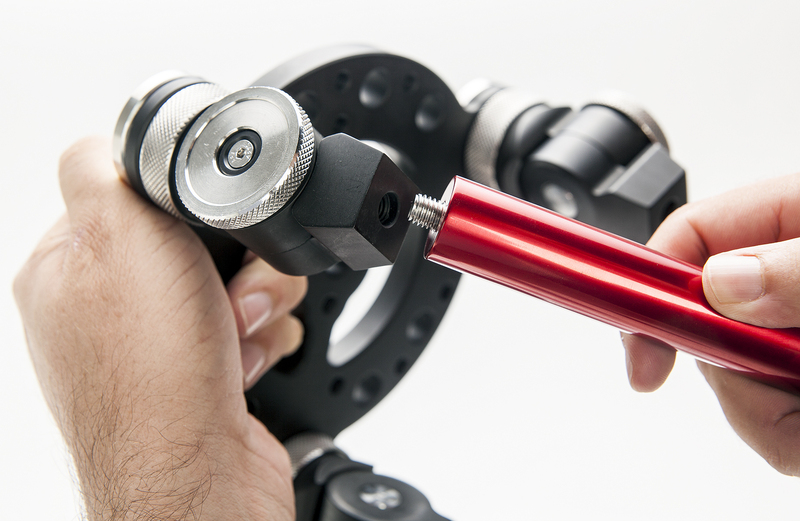 Four of the 1/4"-20 holes are designed to accept our optional high hat riser unit, enabling the use of a fluid head for more flexible and smooth camera movement. 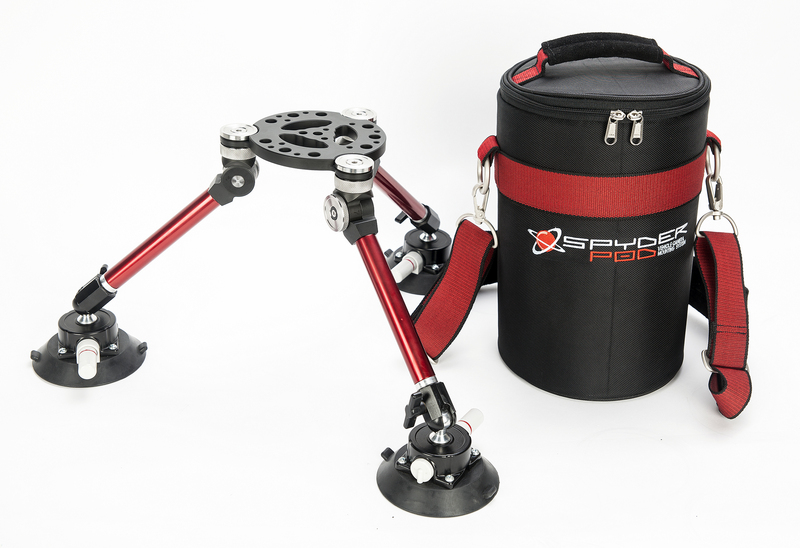 The mounting stage of the Spyder Pod has three leg attachment points that are each fitted with two positive locking ratchet joints, one for tilt and one for swivel. 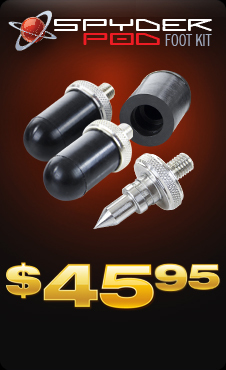 Each locking ratchet joint has a quick-turn knurled lock ring that makes adjusting a breeze. This innovative ratchet lock system improves on the usual friction lock method through a spring-loaded ball bearing mechanism. 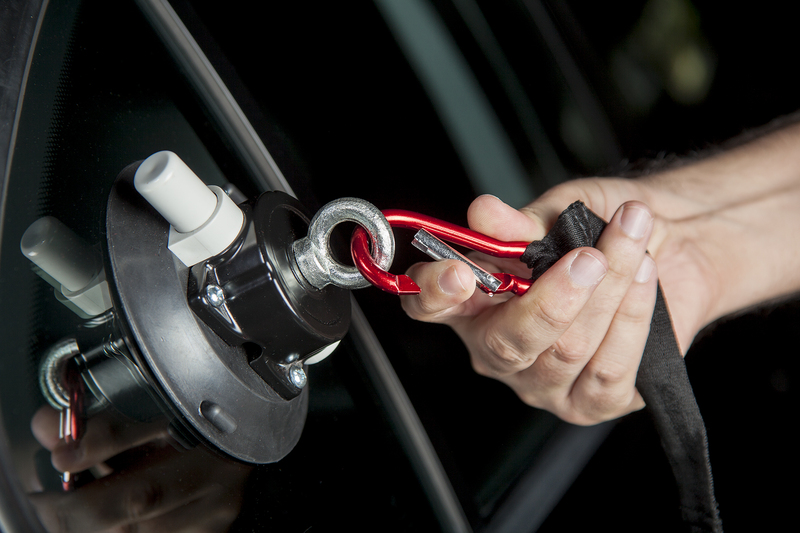 You can unlock and lock each joint with a slight twist of the wrist and no pressure. Once locked, the no-slip ratchet positioning system assures the camera won't shake from joint movement while the vehicle is in motion. 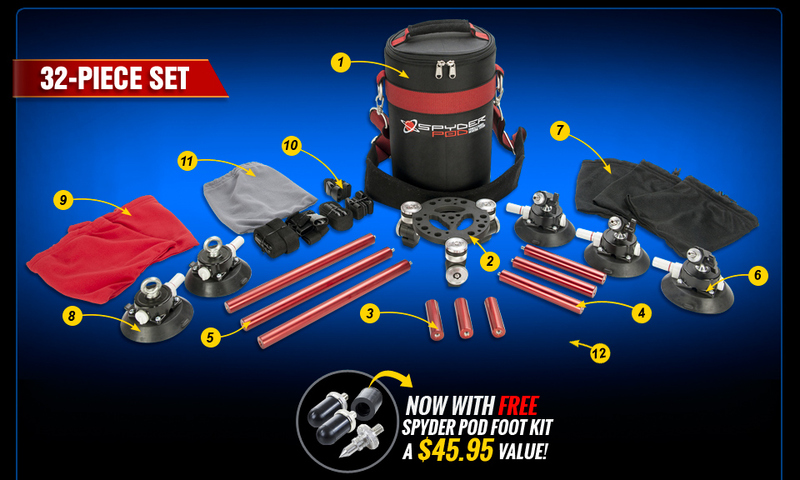 The Safety Kit provided with the SpyderPod includes 2 suction mount safety anchors, 3 variable length safety straps, 2 pinch strap anchors, 2 velcro anchor straps, 2 carbiner anchor straps and a convenient set of soft cloth bags to keep everything organized and clean between uses. 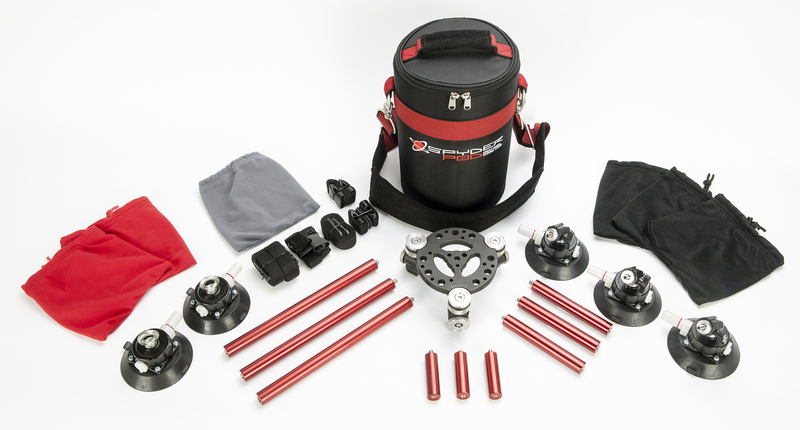 This comprehensive safety kit allows you to secure your camera and the Spyder Pod mount to up to three additional anchors on your vehicle. 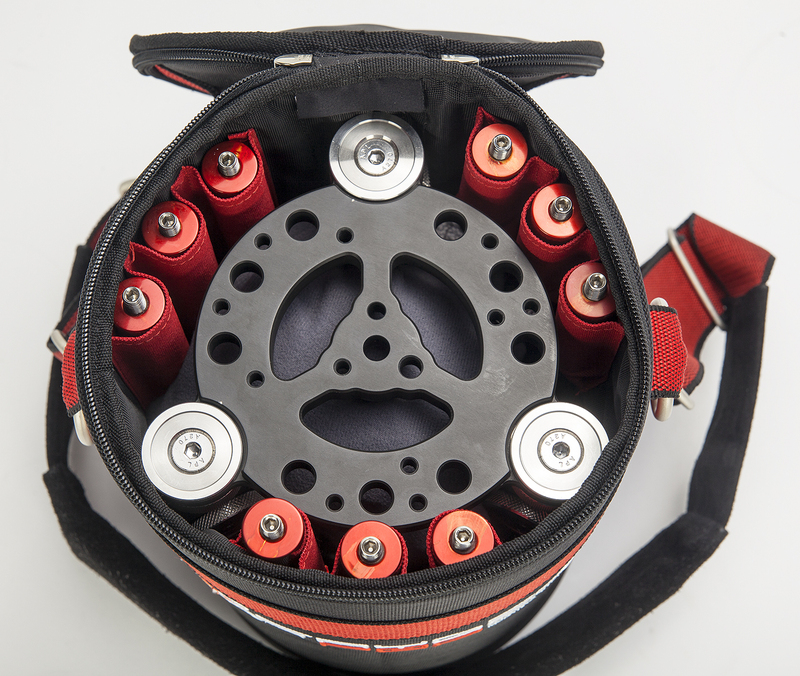 An attractive compact bag holds the complete Spyder Pod system. 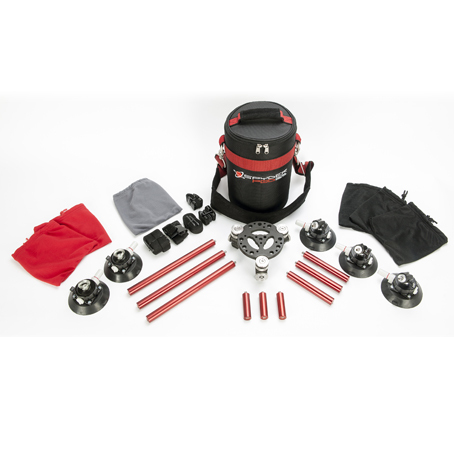 It includes a heavy-duty padded shoulder strap and top carry handle, a large central cavity to hold the camera base plate and color-coded suction mount and safety strap bags. 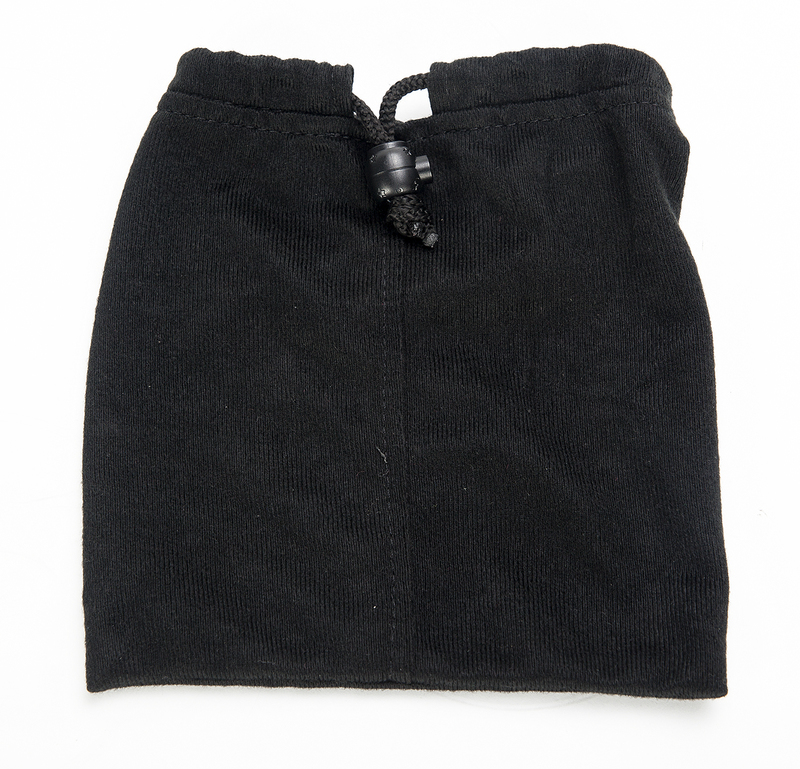 Ringing the inside walls of the bag are a series of loops designed to hold the nine leg extension rods, keeping them secure and easy to access. The SpyderPod system can be mounted to a follow vehicle that will be used to track shots of a second vehicle. In this example we used the optional SlyderDolly high-hat riser accessory to attach our camera with a fluid head. We also used the safety kit included in the SpyderPod kit to secure the camera, giving us three additional anchor points. This setup is great for tracking cars with almost 180 degrees of pan, something that would be impossible while shooting through a window. You can also mount the SpyderPod system on the side of a vehicle to get a close-up shot of the driver. 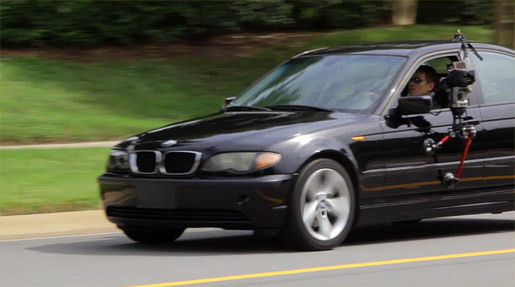 This is great for capturing one or more people in a car while in motion. This shot could be achieved using a green screen, but with the SpyderPod you can capture the real-life action of driving and the real motion of the background, saving you from a time-consuming composite in post-production. 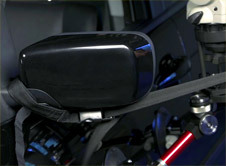 A variation of the previous shot is to mount the Spyder Pod on the hood of the car to capture the car's interior through the windshield. 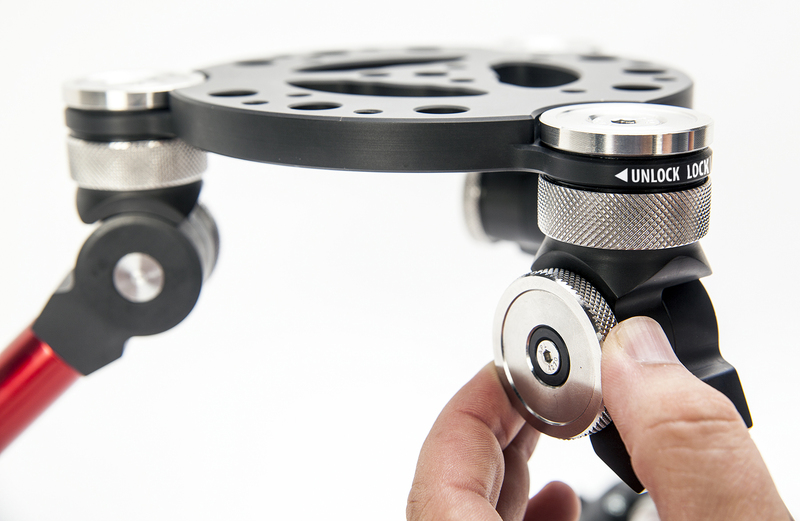 For this shot we mounted the camera directly to the mounting stage of the Spyder Pod. 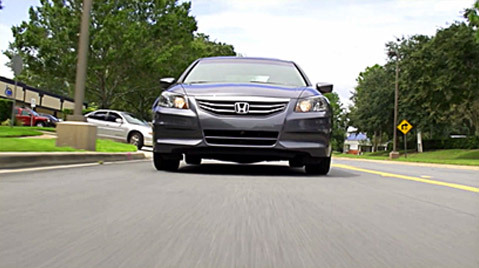 This setup allows you to see the motion of the exterior of the vehicle and its surroundings, as well as the reflections in the windshield. Once again, this will save you time in post. Plus, actors will always give you a better performance when their actions are as real as possible. To achieve a dynamic low-angle shot on the front of a vehicle, you can suspend the camera inverted from the rear of a lead vehicle. Again, the camera shown here is attached directly to the camera mounting stage of the Spyder Pod and secured with additional safety straps from the Safety Kit. Shooting video from a moving vehicle for photographers, videographers and filmmakers can be a challenge, but a reliable vehicle camera mount can add tremendous impact to your shots and increased value to your production. Until now, vehicle camera mounting systems have been expensive, ungainly, complicated, risky to use, unattractive to look at -- or all of the above. Once again, Digital Juice comes to the rescue with the development of an affordable, compact, vehicle camera mount solution which is innovative, attractive, easy-to-use, reliable and a tremendous value for the money. The Digital Juice Spyder Pod Vehicle Camera Mounting System is a complete solution for photographers and filmmakers contained in a lightweight attractive carry bag. Using three professional-grade suction mounts and built with precision-machined high-grade aluminum and stainless steel components, this high quality vehicle camera mount system is strong and secure - giving you the confidence you need to safely achieve your desired moving vehicle shots. 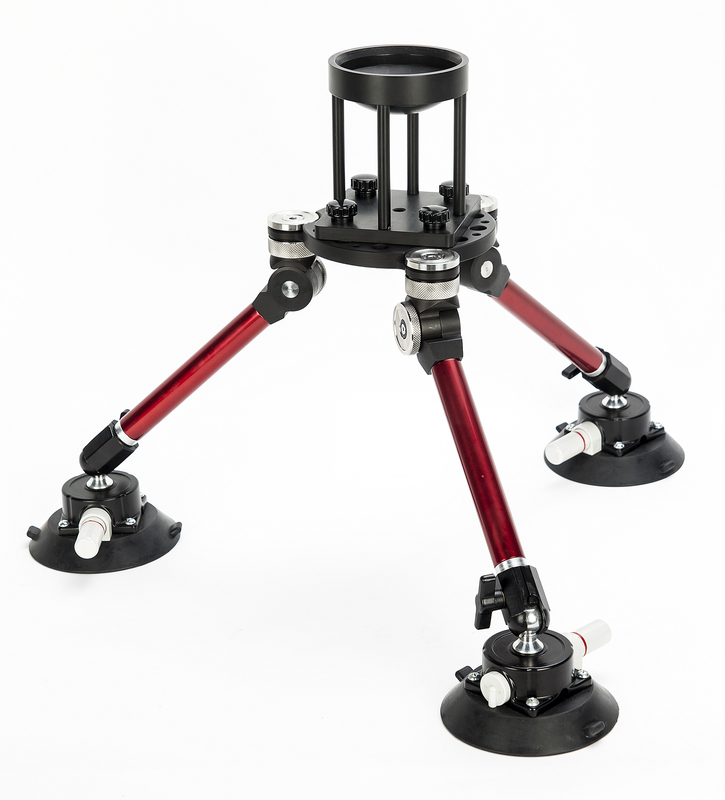 Each suction mount is fitted with an adjustable ball joint, allowing for an extensive range of lockable positions for the attached interchangeable multi-length legs. 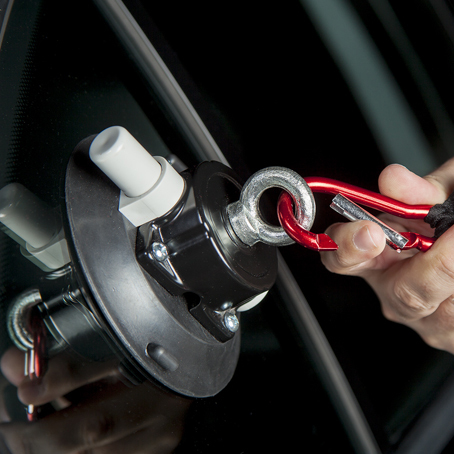 Vacuum-actuated industrial grade 4.75" suction cup mounts can be affixed to just about any smooth surface on any vehicle. 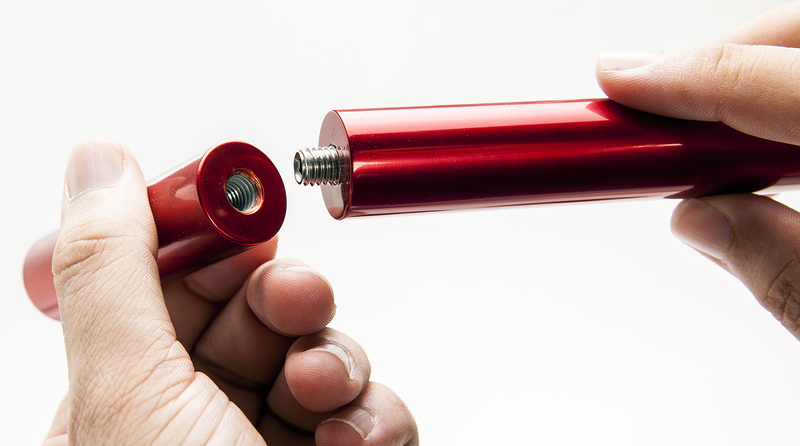 You get a solid, stable, adjustable base for the Spyder Pod's 3 variable length legs. A few pumps of the large pin on the side of each unit and you are in business. The built-in low suction indicator helps to insure that Spyder Pod, and its valuable cargo, remain securely attached to your vehicle. 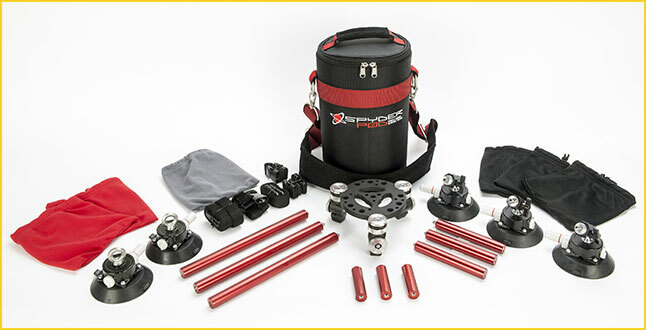 Quick and easy to set up on any vehicle with any camera rig or configuration Variable length legs, adjustable ball joints on top of each suction cup, ratcheting attachment joints and a variety of accessory mount and safety tether options mean you can adapt the Spyder Pod to any shooting situation quickly and easily. 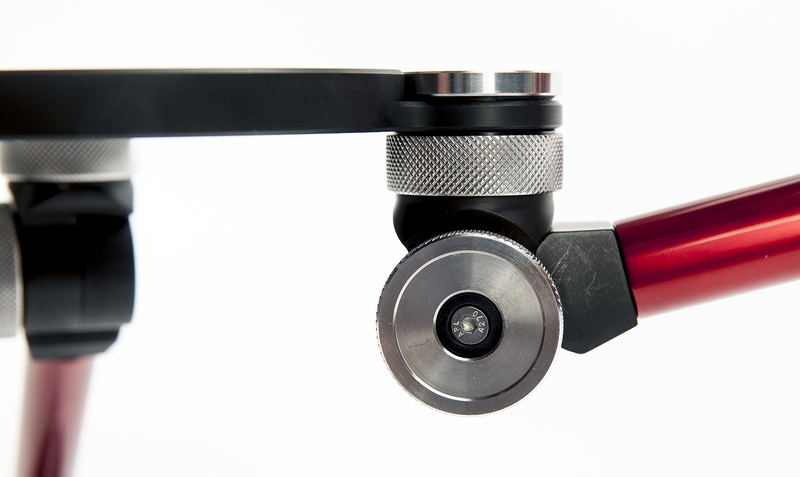 Camera plate, joints and extension rods in three lengths are machined from solid high quality aluminum and stainless steel Spyder Pod components are made with a high attention to quality, durability and usability. They also combine to form an attractive, professional-looking piece of gear that you will be proud to display on any production set. 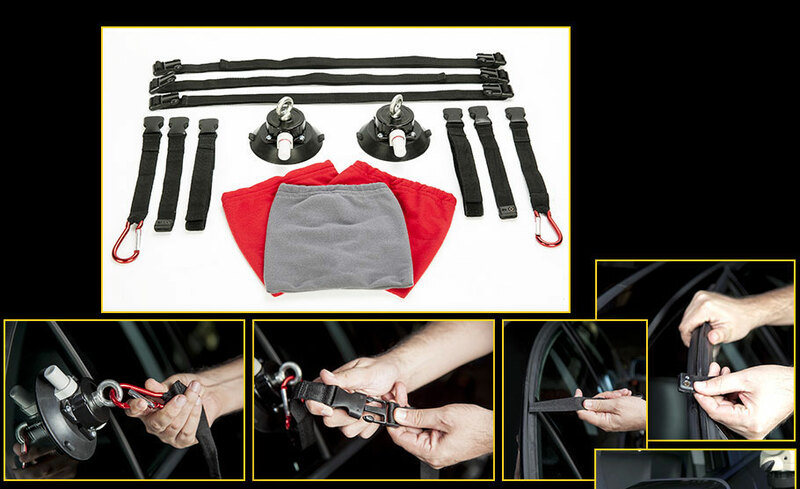 Kit includes safety straps & tethers, a stylish compact carry bag, extension rods in 3 sizes & a camera base plate with a wide variety of attachment options You get everything you need in a lightweight, compact package so that you can safely and easily mount just about any camera to any vehicle in a wide variety of configurations and positions. 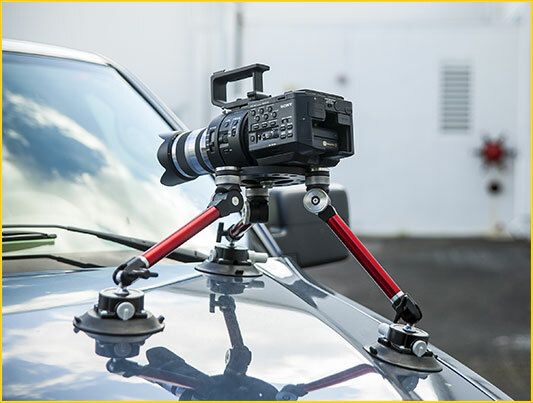 Versatile, sturdy high quality mounting kit provides flexibility & safety for you & your camera when shooting from inside or outside of a moving vehicle You don't have to worry about damaging or dropping your gear when getting that all-important moving vehicle shot. Plus, you can rely on the shake-free footage you can capture with your camera attached safely where you need it. 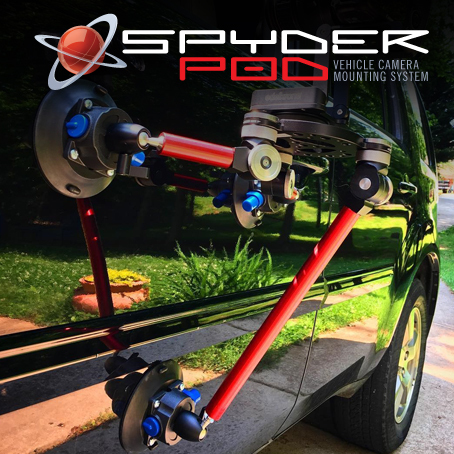 Suggested 50 lb load capacity for camera base mounted with 3 suction cup legs Just about any camera rig or setup can be safely accomodated by the Spyder Pod on your next vehicle shoot. 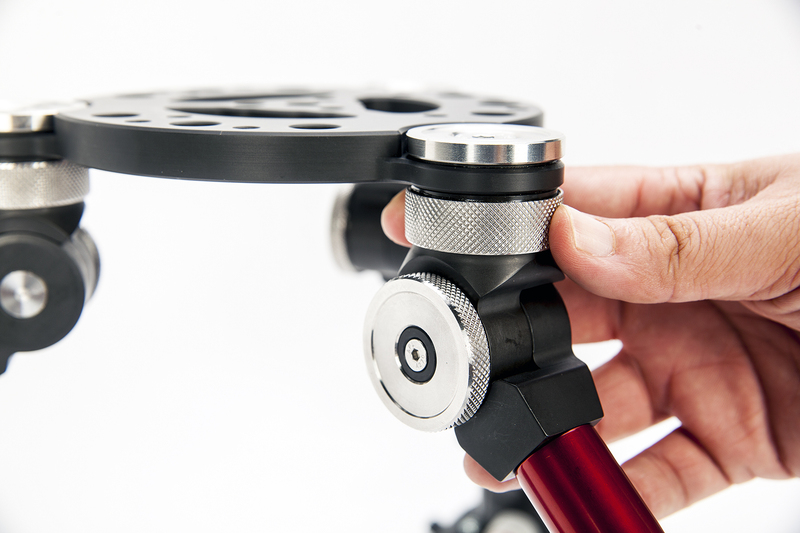 Three adjustable length legs attach to the camera base plate joints. The nine leg extension rods are all 7/8" in diameter. Three rods are provided for each length - 3", 9" & 12". These rods can be linked together in any combination you need to create the perfect length Spyder Pod legs to fit your shooting situation, positioning the Spyder Pod unit at a variety of distances and angles from the vehicle.